Kamadhenu cow also known as Surabhi or “Cow of Wish” is a divine goddess described in Hinduism. Kamadhenu is a cow of plenty who fulfills all the wish and is portrayed as the mother of all cows. Kamadhneu is also known as a Gayatri and worshipped as a heavenly cow. Kamdhenu is also known as Nanda, Sunanda, Surabhi, Susheela and Sumana. Kamdhenu Cow fulfills all the wishes of the worshipper. It gives health, wealth, happiness and growth in the life. Kamadhenu is the mother of all cattle. This cow lives in heaven and emerged from the ocean of milk (Khirsagar) during Samudra Manthan. Kamdhenu is the sacred cow and is found in heaven. The worshipper of this cow gets all the amenties of life and he or she never get scarce of any material comfort. Kamdhenu cow puja can help to combat all illness and hurdles. In this verse, it is clearly stated by the Lord Krishna that, among all the cow Kamadhenu is the original wish cow also known as the Surabhi cow. Kamdhenu Cow body parts have it own significance. The four Vedas are denoted by the four legs of the Kamadhenu. Purushartha is represented by the teats of the Kamadhenu Cow. Its face symbolizes the magnificent Sun and the Moon. Its legs represent the great Himalayas. Its shoulders show the Agni. There are different stories related to Kamadhenu Cow. Different scriptures have different view regarding Kamdhenu Cow. Ramayana says that it is the daughter of sage Kashyapa and Krodhavasa. But according to Vishnu Puran, Kamdhenu cow, the cow of wish is the daughter of Daksha. According to Matsaya Puran, it is the consort of Brahma and the mother of the cow Yogishwari. The cow of wish is believed to be in the sanctuary of Goloka (The realms of cow) and in the Patala (Netherlands). In Astrology also Kamadhenu Cow has a great significance. In astrology, the cow or bull depicts the Taurus. Taurus represents the earth, nature and all its boundaries. The Kamadhenu Cow nourishing feature is associated with the constellation Pushya which has a cow “milk giving udder”. Kamdhenu cow fulfill all the wishes of the worshipper so also called as Kalpvrishka ( A heavenly tree) which fulfills all the wishes. Due to wrong deed of the person, a person faces the sufferings in his life. Maa Kamadhenu removes all the sufferings and blesses a person with happiness and fulfillment. 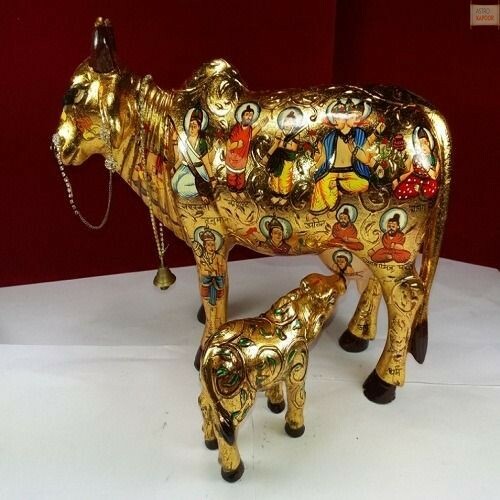 Kamadhenu Cow, “ The mother of all Cow”, can remove the distressful home atmosphere. It is a sacred cow, which is like a chariot of success. 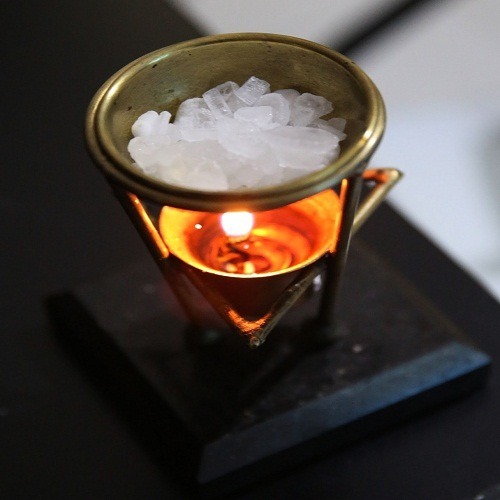 It can be kept at home or office according to Vastu direction. It removes excessive expense if placed in the south-west corner on any Monday. This Surabhi or Kamdhenu cow removes obstacle and hindrance in your life. It removes the problems form each and every sphere of life. The sacred cow is worshipped as sacred animal and it is one form of Maha Vishnu. The house of the Kamadhenu Cow should be decorated after Ganesha Pooja. AArti should be performed in the same way as we perform arthi for Lord Vishnu. If worshipped along with Her calf named “Nandini”, is very auspicious. One who performs this pooja is adored by the blessings of Durga, Lakshmi and Saraswati.